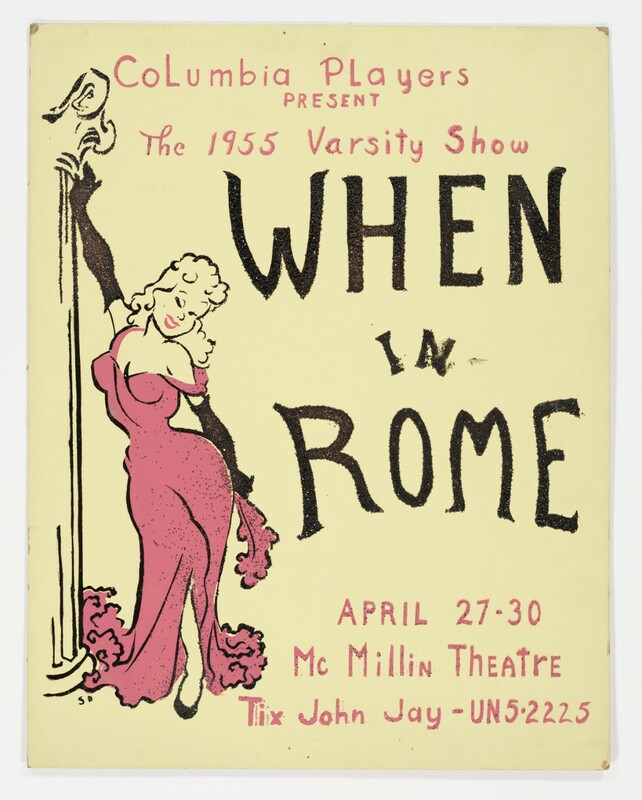 Original poster for 1955 Varsity Show "When in Rome." Varsity Show Records, University Archives, Rare Book and Manuscript Library, Columbia University Libraries. Over the years, the Columbia University Archives has collected audio and video recordings of performances, games, events, and speakers on campus on different media (8 inch reel-to-reel tapes, audio cassettes, vinyl records, etc.). A small portion of these recordings has been digitized and is now available for researchers. Below is a sampling of some of the files available in our collections. Selections from the 1933 Columbia Symphonic Band recording. The RBML cannot provide access to original time-based media material which has not been first been reformatted for preservation. Researchers are welcome to examine archival time-based media items and decide whether they wish to place an order for Audio/Video reformatting. If copyright and/or condition restrictions apply, it may not be possible to digitize a requested item. Please note that A/V reformatting is handled by an outside vendor and typically takes 6 to 8 weeks.